Ever seen a successful businessman blush when asked about his prices? Or watched as Russell Brunson and James Wedmore apologize for the price of their masterminds? Have you ever seen them give a ‘friend rate’ and then included extra private sessions in their offer…just to be nice? And yet female entrepreneurs do this every day. While women are planning elaborate free webinars—and leaving off their sales pitch for fear of seeming like a money-hungry cow—the ‘big boys’ in business are selling, serving, and growing their empires on repeat without apology. And good on them! Driven by the fear that screams ‘no one’s going to buy this!’, women create self-fulfilling prophecies of scarcity. With zero faith in their ability to sell, they skimp on ad spend, hold back their sass, refuse to hire quality support, and then find themselves checking their ads on the hour for internet trolls harassing their work and competitors calling them a scam. In order to rise up, bridge the income gap, and earn real money online, we must call in a new era of shameless wealth empowerment for women. Breaking these five nasty habits will shift you from chronic under-earning to being respected as an expert in your field…with an income to match your brilliance. I’m sure you’ve used these excuses to avoid getting your gorgeous face on live video. The truth is, you don’t need to be featured on Forbes, be an Instagram star, dressed like you just stepped out of Vogue and have perfectly polished videos like Marie Forleo to make a heck load more money online. As long as you hide your radiance, gifts, and message, you will—through lack of action—passively repel the clients whose lives you can change and whose business can change yours. Why live video? Because people want to see you, hear you, and experience your potent presence. Hiding yourself is a form of energetic constriction, and financial flow cannot exist within that space. We live in a world full of busy people rushing from one thing to the next, and with short attention spans to boot. In order to captivate, connect, and engage your audience, you must be fully present in your power…right in front of their faces. To magnetize the clients whose lives you can deeply transform, you must unapologetically share your mission and message. What are you truly here to express? What would you really say if you put aside your fear of being judged or shamed? What are the secrets you tell your best friends that would change the world if you had the courage to share them in public? The idea that you’ll be judged and ostracized for what you have to share is just an age-old story we’re holding on to passed down from generations of persecuted women. How would it feel to take a stand for your mission and message, and shift into an unconditional belief that you’d be adored for your magic, rather than burned at the stake? When you stop attacking yourself internally with the drama of doubt and fear, no one will be able to attack you. You’ll become bulletproof because you’ll realize that your opinion of yourself means so much more than anyone else’s. Recognize that what people say about you…really isn’t about you anyway; it’s often just their own insecurities and fears coming up. Stand firmly in your message and mission, and claim the role you came here to play like a queen who is ready to rule her empire. And then? It won’t matter if you’re in sweatpants or a ball gown or have only 100 people on your email list, you’ll RISE regardless. Liberate yourself from giving a F#CK about what people think, and let them see, hear, and know what you’re really made of. Make a list of 3 to 5 HOT topics you could create epic livestreams on this week. These can be things you’ve never had the courage to share before.Take a risk. Speak up. Be vulnerable and make sure to pitch your work (this is connected to breaking habit no 2 below). Write out a brief pre-livestream mantra or prayer that focuses you on service, sacred selling, and magnetizing your clients. Go live with one of your video topics today, after reading the rest of this blog, even if it scares the bejesus out of you! If you want wealth, cash and influence, you’re going to have to get comfortable SELLING. Selling means being seen, taking up space, and taking a stand. Selling is not manipulation or coercion and requires absolutely ZERO sleaze, scarcity or force. You can shift selling into a process of extending an invitation that comes from a place of service and soul. Selling is one of the most holy, sacred acts you perform in your business because without selling, you can’t serve. …and then you never make your effing offer! Let’s get honest here: how will you ever sell if you’re not pitching your services? If you think that free content (with no pitch) will magically make people beg and plead to work with you, you’re deluding yourself. You’ll still be exactly where you’re at today waiting for clients in two, three, four years time.. Without cash flow, your business and incredible work will die. And the only way to cash flow is to open yourself to receiving by asking for the sale. It’s ridiculous how long women will keep themselves trapped in shame, tip-toeing around their offers like selling their work is operating some kind of shady scam. The feast and famine cycle of selling-shame has to stop. Make your offer until you’re reciting your sales pitch in your sleep. Start loving sales and allow this sacred invitation process to become second nature. Grab a pen and paper and write a rough draft of your pitch. Don’t forget a clear CTA to get on a call with you! Practice, practice, practice—AND add your perfect pitch to the end of your livestreams. Female entrepreneurs tend to sweat over their ‘official’ title. Wellness Coach. Manifestation Medium. Career Creatrix. No one gives a f*ck what you call yourself. They care about what you can do for them. If you can’t tell someone exactly how you can serve them in one minute or less, you have a problem because confused people? They don’t buy. Most women are not clearly articulating their value. They don’t really know what it is they do, so no one else does either! That offer we talked about in #2? It must evoke a deep response from your soulmate client. They have to feel the power of the change you can create in their lives. I see too many women wasting time hustling themselves into burnout, selling an offer that’s simply not going to move the dial for their clients or their cash flow. Rather than offering a package or program that’s of epic value, they’re offering $97 session specials, $1K six-month programs, and low-priced monthly memberships. The ‘logic’ behind undervaluing and underpricing is usually rooted in a feeling that we’re doing our clients a favor by making our services ‘more affordable’. In reality, this is bargain-bin B.S. that generates a massive disservice to your clients because charging less than your services are worth means you’ll have to take on more clients, which means working more hours but giving each client far less. Ask yourself: What is the highest service I can offer my clients? What’s it going to take to give them the outcome they toss and turn thinking about at night? If you can really deliver and your ethics are solid, the price of your package becomes limitless—$5K, $10K, even $100K. To be clear, you’re not putting a high-priced tag on a crap offer. You get paid the big bucks for creating unrivaled transformational change for the audience you serve. There is a huge market for your service. No matter the niche, no matter the price. Do you think Chanel cares that you think their $20,000 designer ball gowns are outrageously expensive? Not a chance. They know their market and that’s who they’re speaking to, and that’s who’s buying millions of dollars in product each year from them without batting an eye. Grab a pen and paper and write out exactly how you can help someone. This should take you one minute or less to read. Identify the 5 pain points that are top-of-mind for your clients and that you can help them with. Write down the 3 most powerful OUTCOMES of your offer in a way that even a ten-year-old could understand. These should resolve the pain points of your client directly! Because I deeply respect the women I serve (that’s you), I’m brutally honest about what it takes to build a seven figure empire. Right now you’re most likely running your business like a novice, or worse, like a charity. Between undercharging, hiding behind a wall, and resisting cracking open your wallet to spend more money on ads, you’re keeping yourself in perpetual poverty. #1: Your messaging on video and in your copywriting (titles, posts, blogs, emails, funnel) must be on point, clear, and evocative. #2: You’ve got to back yourself with a financial investment in running ads to a streamlined funnel with offers that speak deeply to your audience. You can do this while staying grounded in your femininity, authenticity and your heart. STOP ‘marketing’ and START connecting. Online we’re blasted with ads all day long. You have 2 seconds of someone’s time to make an impression. They don’t care who you are, how successful you are, or how many Maseratis you have parked in your driveway. We need to WAKE PEOPLE UP! Your audience is sitting in front of their computers like they’ve just been hit with a tranquiliser dart. If you can’t shake them out of that passive state, you’re not going to sell. You’re going to put people to sleep. When you own your voice, are visible and stand powerfully in your message, you’ll finally reach the thousands of people who need your work. Imagine having a lead machine that brings in sales for you every single day. This is the shift that transforms you into a global leader diva. Remember: you need to expand your audience with more than just luck and manifestation. Write out your core message: what is the real transformation you’re here to create in the world? Hold nothing back. Get laser lucid clear because if you’re not sure what you do, no one else will be! Where do you need support in your business? Is it in writing, tech, funnel, ads? Start planning to invest and expand your empire now without driving yourself into the crazy land of overwhelm! Your enrollment process doesn’t have to be a fancy funnel that involves a dozen upsells and downsells. It can be a simple two-step process. Opt-in to my freebie and sign up to a call. Done. That’s all you need, but most entrepreneurs haven’t even set up a clear process to get people on calls with them…and then we’re back to not selling because there’s no pitching! When I filled my first mastermind, this was my entire funnel: a free offer (which I still use today), followed by an invitation to get on a call. This simple 2-step funnel made me my first $150K in about 4 months. You can use https://youcanbook.me/ to have new subscribers booking directly into your calendar for a call. Check out ceodivaconsult.com for an example of this. Be sure you’ve renamed the page with a unique domain name so you make it EASY for prospective clients, and add your own branding and testimonials. Using this system, my team can easily approve or reject requests for consultations. If someone does not have at least $200 to $1000/month to invest in their business, we don’t speak with them. Instead, I’ll auto-send a beautifully written letter directing them to an inexpensive product. (In this case, a $27 product to get them on the road to making more money). This letter ensures they feel honored and worthy regardless, because they are. The letter also acknowledges that they’re at a different stage in their business development while still providing a solution. Some prospective clients will need to raise their emotional and money IQ before they can invest at the level of your high-end packages and programs. And that’s fine, as long as you have a process that takes care of those people too. Purchase a custom domain making it effortless for you and your clients to get a call on the table to see if you’re a fit or not! Sign up for an account at youcanbook.me to streamline your application and approval process. Get out there and SHARE that link with heart, soul, and a juicy offer, babe! 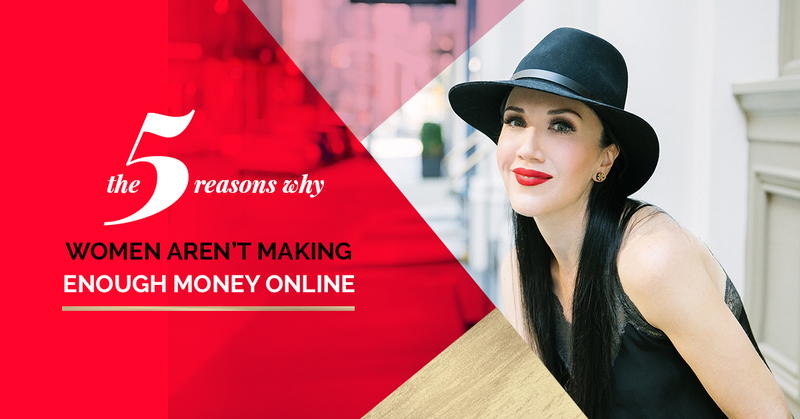 It’s time to really make money online. You need to start selling. You need to start packaging up your brilliance and telling the world about it. You need to start running your business like a divine empire not a charity and without apologizing for being a savvy CEO. Instead, imagine saying, ‘What the eff happened? !’ in total AWE of what you’ve created and accomplished in that time. If you want the freedom, the big-bucks, and the dream business, you need to educate yourself on what it’s really going to take. It’s not hard; you just may not have learned all of the skills you need yet. I wasn’t born with everything I know now either. I had to choose to master them. My clients who are making millions a year aren’t special, but they are doing things differently and deliberately. Come join me for a free training if you’re ready to supercharge your business savvy and recover from chronic scarcity, shame and suffering. We’ll be diving deeply into my 7-figure secrets, which will take what you’ve learned here to the next level. I’ll share how I went from broke and hustling for $100 sessions to rocking my million-dollar empire. This is unlike any business training out there, and I’ll be holding NOTHING back (not even the not-so-pretty stages of the journey). Come along! I’ll be answering questions live—my clients pay a heckuva lot of dosh for this level of training. Here’s to the end of chronic hustling and under-earning forever! 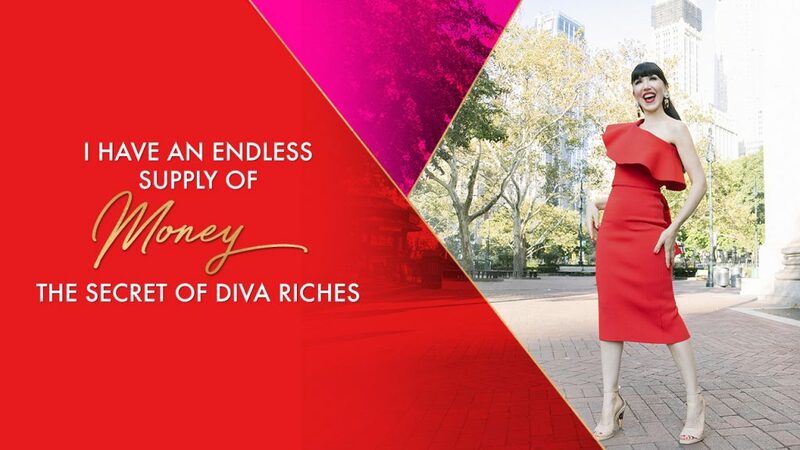 Ingrid Arna is a Leading 7-Figure Business Strategist and the founder of CEO Diva Business School and the Gucci of online business programs, High-End Empire. She’s been endorsed by Kate Winslet for her work and has been featured in Cosmopolitan, Instyle, Huffington Post, Good Health Magazine and on The Steve Harvey Show. 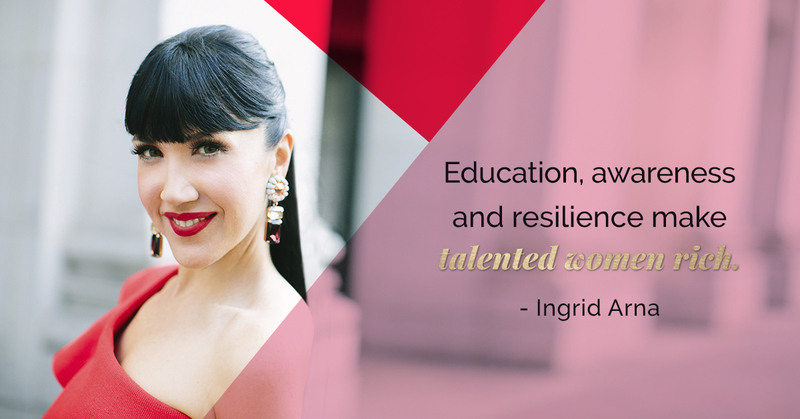 Ingrid leads visionary entrepreneurs into conscious wealth and global impact, without sacrificing their soul. The only new year’s resolution she’s been able to stick to since becoming a mother is quadrupling her prices and giving up her thongs for granny pants. She’s never been happier. 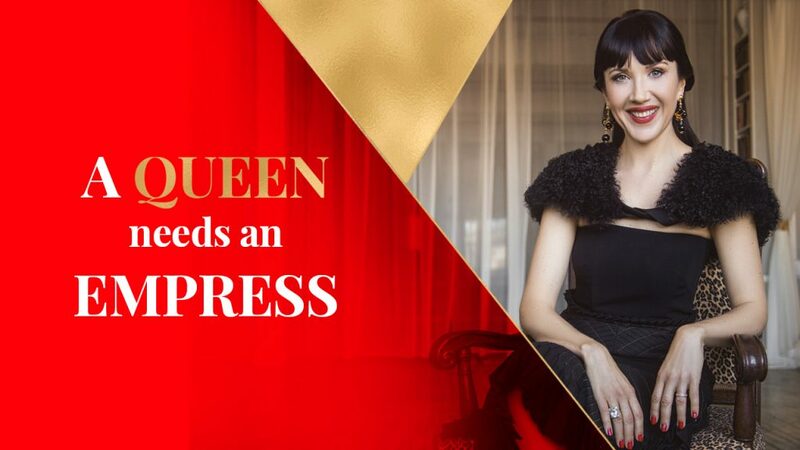 has grown her coaching and healing empire to 7 figures in under 2 years by teaching her students how to monetize their brilliance, own their inherent power and authentic voice (without losing their lady mojo). started her career at A Current Affair at 20.
launched her own clothing line, BodyLove, in NYC. wrote her book BodyLove Diet, endorsed by Kate Winslet, which helped thousands of women to get their self-love mojo back in the game. created a TV show on women’s empowerment with supermodel Carré Otis. forged a partnership with one of New York’s leading ad agencies. raised $350,000 in capital for a start-up company. presented on QVC, the home shopping network (what a trippy experience)! created the world’s most powerful, proven and repeatable High-End Empire system to grow sustainable businesses for visionary entrepreneurs. founded and leads High-End Empire School and Divamind, an advanced marketing and emotional healing curriculum that teaches entrepreneurs how to use advanced systems to go from 5-figures to 6-figures, from 6-figures to multiple 6-figures and then to 7-figures. The school, which is both digital and live training, successfully mentors hundreds of entrepreneurs every year.